“Where can you get a decent cup of Java in this town, anyway?” This question is the point of departure for tonight’s second Coffee Workshop. 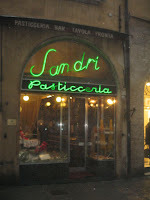 The workshop begins with a short jaunt around the center, with an explanation of the different cafés and their “flavors”: Sandri has the best pastries and is frequented by Perugian high society, Caffè Morlacchi is the bohemian student hangout, while Turreno is historically host to Perugia’s leftist citizens. The second part of the workshop is the tasting and discussion of coffee’s “cultural geography.” Students will have a chance to try a variety of different coffees (caffè macchiato, marocchino, caffè in vetro) and will learn how each of these has a certain place not only in the day (cappuccino for Italians is strictly a morning drink, for example) but also a specific cultural meaning (an espresso in a little glass cup, instead of ceramic, lends a certain elegance to the drink). The workshop is one in a series organized by the Umbra Institute. The next one will be the Pizza Workshop for Thursday, February 4th.